Jamnalal Bajaj (right) receiving Sarojini Naidu at Wardha station for a Congress meeting, 1936. Sarojini Naidu and Abul Kalam Maulana Azad at Bajaj Wadi, Wardha, 1936. 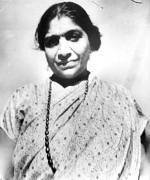 Sarojini Naidu at the cremation site of Mahadev Desai and Kasturba Gandhi at Poona, 1944. 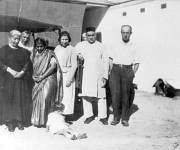 Sarojini Naidu at Phoenix Settlement, South Africa, 1923. Hermann Kallenbach (2nd left) with family and friends, 1923. 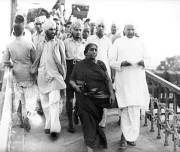 Sarojini Naidu getting off a ship together with Rev. Charles Freer Andrews (left of Naidu). 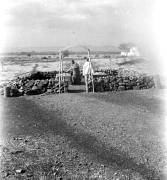 Sarojini Naidu at the cremation site of Mahadev Desai and Kasturba Gandhi, Poona, 1944. Sarojini Naidu, Narendra Nath Sen Gupta and hs wife (from left).